1. What can I do with this product? NovoConnect Solution is a wireless projection and collaboration device. 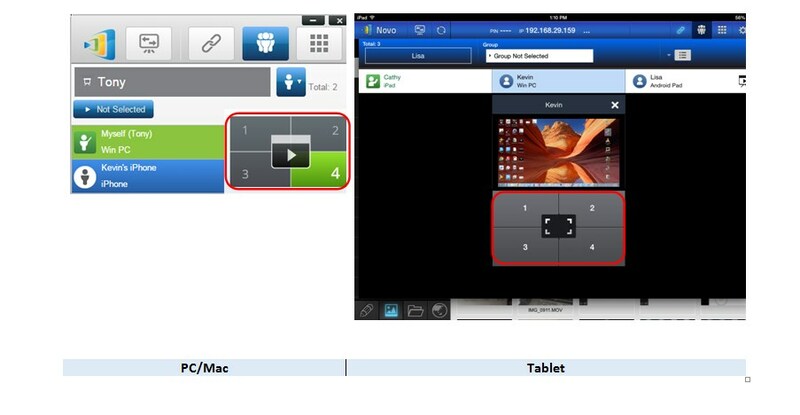 Teachers can use it to organize student activities in BYOD (bring your own device) classroom environment. Companies can use it to facilitate interactive and engaging discussion in meeting rooms. 2. Can I connect a Novo device to an LCD monitor? Yes, you can. As a matter of fact, you can connect our products to any display equipment with an HDMI port or a VGA port (via an adaptor). 3.What display resolutions does a Novo device support? 4. What can I do with the USB port? Connect a USB mouse/keyboard to configure the device with ease or connect a LCD Touch panel / interactive module with USB to the device to get touch support. 5. What types of PCs or tablets will work with a Novo device? 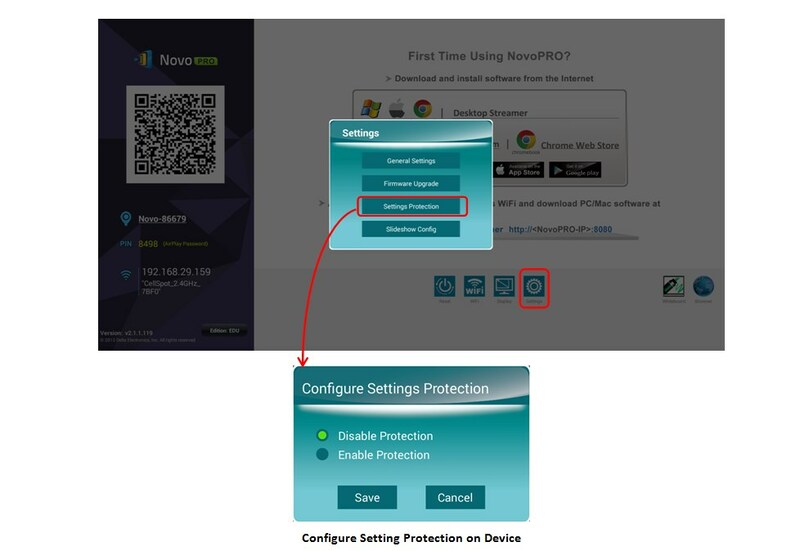 NovoConnect Solution supports a variety of devices (including Chromebook), making it perfect for BYOD environment. 6. How many users can connect to a NovoConnect Solution device at the same time? 64 users when the device is connected to an existing WiFi network. 8 users when the device is configured as a WiFi Hotspot. 7. Is my data secure when I use Novo device to share my screen? Yes, your data is encrypted using AES-128 encryption to ensure data security when you set the device to Corporate mode. 8. What is the key difference between the Education Edition and Corporate Edition? For Education Edition, there is always a moderator (normally a teacher) to host such a class session. On the other hand, for Corporate Edition, a meeting might or might not have a moderator (a meeting organizer). Their feature differences are summarized in the following table. 9. My company does not allow me to load drivers or software on my computer but can I still use the device? Yes, you will need to purchase the optional Launcher. The executable file is contained within the Launcher and no software is loaded onto your computer. In addition, the Launcher provides very easy operation – you just need to click a button to display your screen. 1. Can I use the USB port on the back of my projector to power the Novo device? As long as the USB port can supply 2.0A, it is going to work. 2. My projector only has a VGA port. How can I make it work with the Novo device? You will need a HDMI to VGA adaptor to do the conversion. 3. Where can I get the software for my laptop and tablet? For PC/Mac, go to http://www.vivitekcorp.com/ and download software Desktop Streamer. For Chromebook, visit Google Chrome Web Store to download and install the Novo Desktop Streamer app. For iPad or iPhone, visit Apple App Store to download and install the NovoPresenter app. For Android tablets and phones, visit Google Play Store to download and install the NovoPresenter app. All above software is free of charge. 4. Can I put my school's mascot or company logo on the home screen? Yes, you can put pictures and even video clips on the home screen (see following example). Please refer to section “5.3 Custom configuration file” of the Novo device’s User Manual at http://www.vivitekcorp.com/ for details. 5. I have set up my Novo device properly for my organization. Is it possible to lock its setting parameters so that nobody else can change them by accident? Yes. 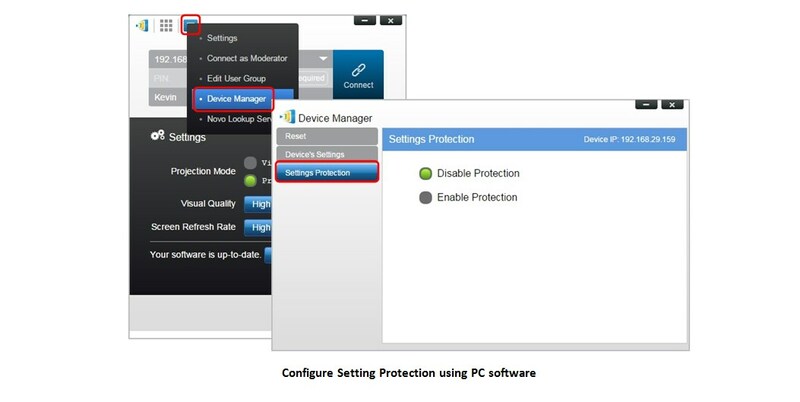 You can enable Settings Protection either from the PC software or on the device. (See the following figures for details). 1. What are Hotspot mode and Client mode? What are their differences? 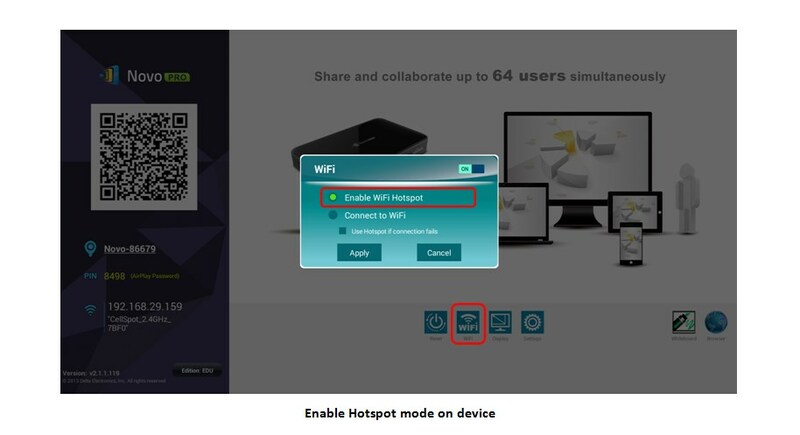 (1) Hotspot mode: The Novo device creates its own WiFi network. You need to connect your PC or tablet to this network to work with this Novo device. 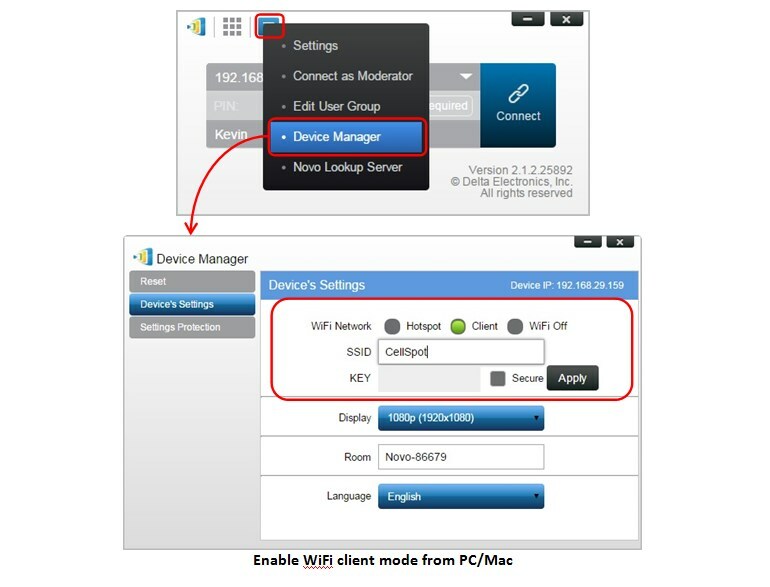 (2) Client mode: The Novo device connects to the same WiFi network as your PC or tablet connects to. Typically it is your school or company WiFi network. 2. How can I enable the Hotspot mode on my Novo device? 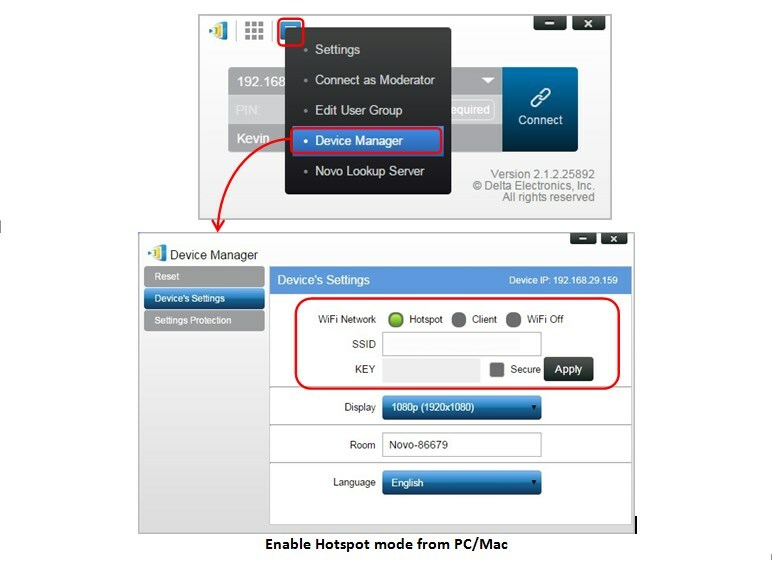 You can enable the Hotspot mode from your PC/Mac or on the device. 3. Can I browse the Internet when I connect to my Novo device in Hotspot mode? This is only possible if you also have the LAN connected. Use a LAN hotspot pass-through. 4. How can I connect a Novo device to my WiFi network? You can set up the WiFi connection from your PC/Mac or on the device. The “Use Hotspot if connection fails” checkbox is available and enables users to decide what to do if the Novo device loses its WiFi connection. When checked, the Novo device will automatically switch to WiFi Hotspot mode when current WiFi connection is not available. (This could happen, for example, when WiFi routers lose power during power outage). When unchecked, the Novo device will not switch to WiFi Hotspot mode. Instead, it keeps monitoring the WiFi spectrum. 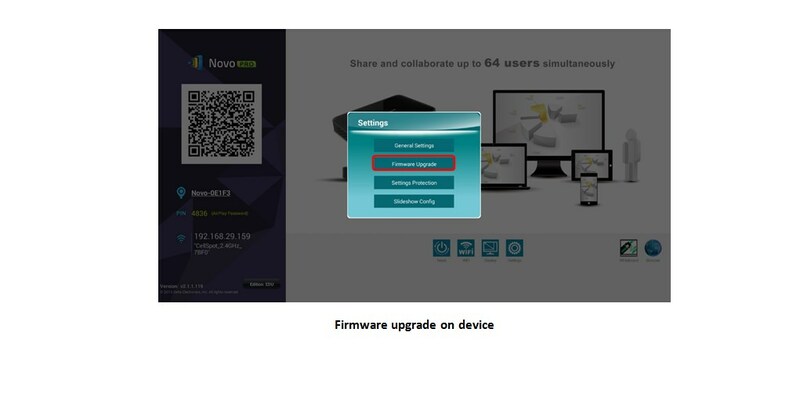 Once the WiFi router is back online, the Novo device will reconnect automatically. 5. I have connected my Novo device to my school's WiFi network. However, it doesn't seem to work. I can't connect my PC or tablet to it. It is likely that your school’s WiFi network has firewall enabled. In this case, you will need help from your IT department. Please refer to the Novo User’ss Manual (Section 2, “Network Setup”) available at http://www.vivitekcorp.com/. 6. I connected my Novo device to my school's WiFi network a few days ago. This morning, I notice that it switches back to Hotspot mode by itself. What happened? You may want to check if the “Use Hotspot mode if connection fails” is enabled on the device. Please refer to question “How to connect a Novo device to my WiFi network?”. 7. Can I connect a Novo device to a wired network? Yes, Novo devices (except Connect devices for which an adapter is sold separately) are equipped with a RJ45 port, which can allow you to connect to your wired Ethernet network. 8. Can visitors connecting to my company's GUEST network access to the deployed Novo device? Yes, they can. Novo devices can be connected to both your organization’s wired network and wireless network simultaneously. This dual-network capability is extremely useful for organizations with guest wireless network set up for visitors. In such a case, the Novo’s RJ45 port is connected to a wired EMPLOYEE network while at the same time Novo WiFi is configured to connect to a GUEST network, as shown on the following diagram. By doing so, you still keep the GUEST and EMPLOYEE networks separated, and at the same time, the Novo device is available to both your guest users and employees. Inside the Novo device, the WiFi section is completely separated from the Ethernet section, namely, there is no network routing between these two sections. Therefore, users connecting to the WiFi section will not be able to access any resource on the Ethernet at all, and vice versa. In short, security is not compromised in this configuration. 1. How can I connect or log in to a Novo device? (1)Connect your laptop or tablet to WiFi. 2. Is a PIN code mandatory? 3. I can't connect to the Novo device unit either by scanning the QR code or entering its IP address. Here is a checklist you may look into. 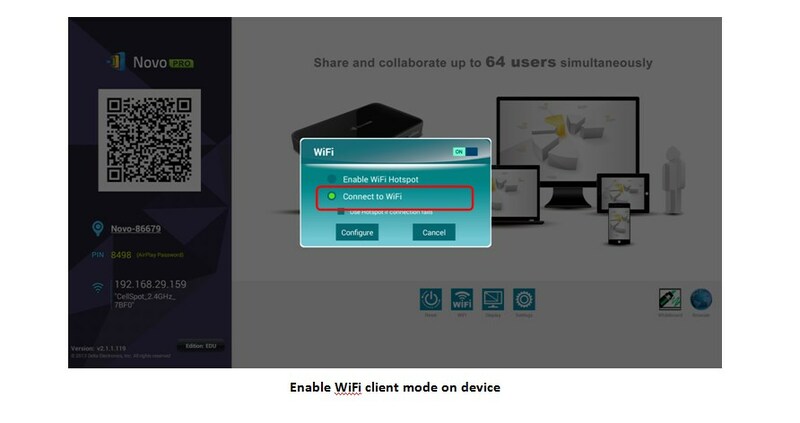 (1) Verify your PC or tablet is connected to the same WiFi network as the Novo device is. (2) Verify the IP address you enter matches the one displayed on the screen. 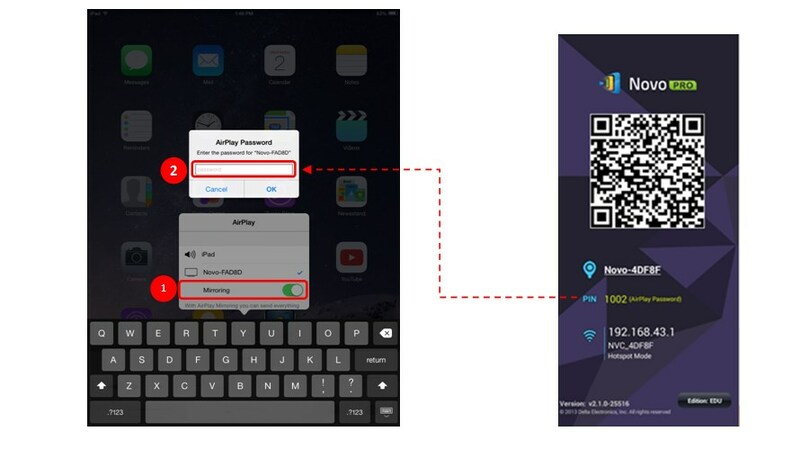 (3) If a PIN code is enabled, verify the PIN code you enter matches the one displayed on the screen. (4) Relaunch the PC/Mac or tablet app. If the above fails, your WiFi network may have firewall turned on. In this case, you will need help form your IT department. Please refer to User Manual (Section 2 Network Setup) available at http://www.vivitekcorp.com/. 4. I have connected to the Novo device but my screen is not shown on the projection. What should I do? (highlighted in RED in the left figure), to view the status of all users. Users with icon , are actively projected on the screen. You may need the moderator to show yours. 5. How to switch a presenter or enter 4-to-1 projection? 6. Can I hand over my moderator to someone else? 7. I am a teacher. How can I preview my students' screen? 1. Are there going to be future software upgrades? Do I need to pay for them? All software upgrades will be free of charge. 2. How can I upgrade my PC/Mac's software, Desktop Streamer? (1) You can visit http://www.vivitekcorp.com/ to download the latest software. (2) Connect your PC/Mac to the Internet. Launch Desktop Streamer and it will search for upgrade automatically. 3. How can I upgrade my tablet's app, NovoPresenter? 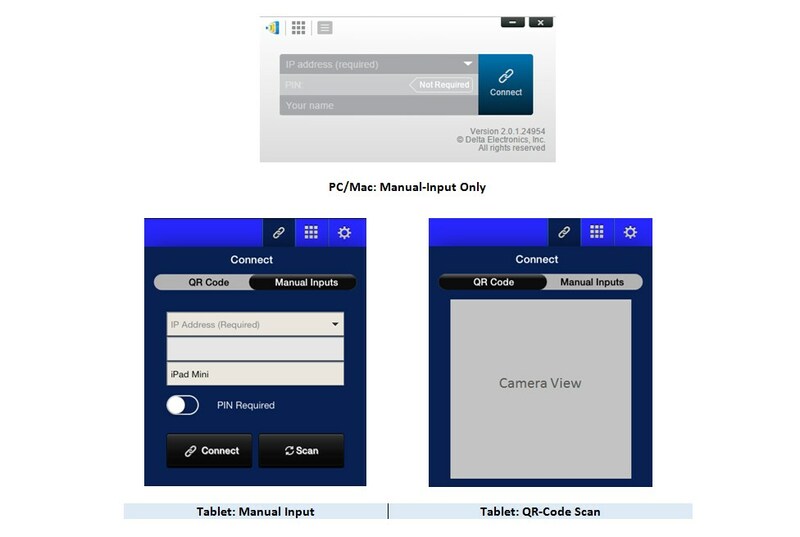 New versions are available through the App Store on your smartphone or tablet. 4. How can I upgrade my Novo device? 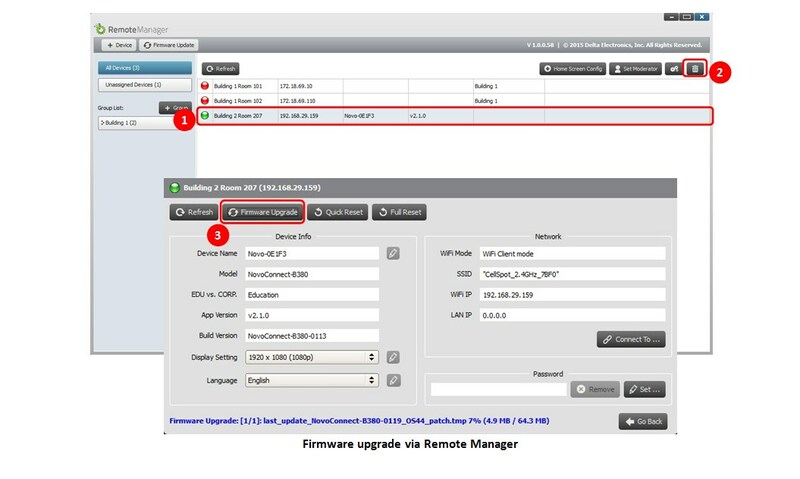 You can initiate the device firmware upgrade from Remote Manager software running a PC/Mac or on the device. 1. What can I do with NovoPresenter? Creating polling and voting on a class and access student responses instantly. 2. What file types can NovoPresenter open? 3. Can I access my files in Dropbox or Google Drive? 4. How to share videos via a Novo device? 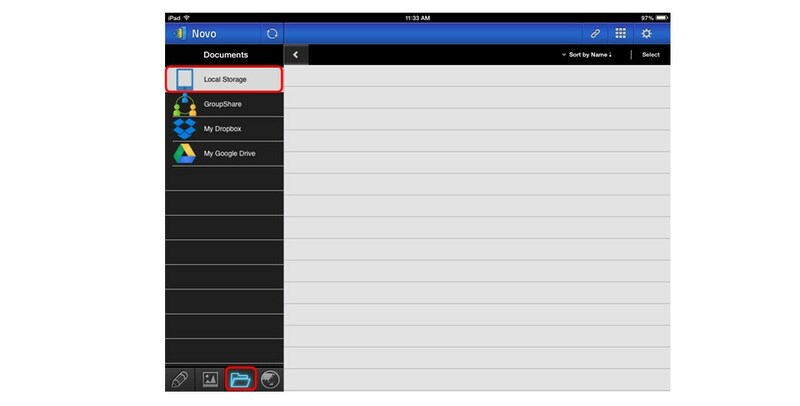 For local video clips, tap the Documents button in the left bottom corner and then choose local storage. You can also play a video stored on cloud storage such as Dropbox and Google Drive. For YouTube clips, tap the Web button in the left bottom corner and then tap the YouTube button to open the YouTube window. Paste or type the URL of the YouTube video you wish to play in the address column. 5. Can I mirror my iPad/iPhone? Yes, you can mirror your iPad/iPhone to the projection screen via a Novo device. No app is required to use this function. 1. Connect your iPad/iPhone to the same network as your Novo device. 2. Swipe up from the bottom of the iPad/iPhone to show the Control Center. 3. Click AirPlay and select the Novo device’s name. By default, the Novo device is named Novo-XXXXX, where XXXXX is a device-generated combination of letters and numbers. 4. 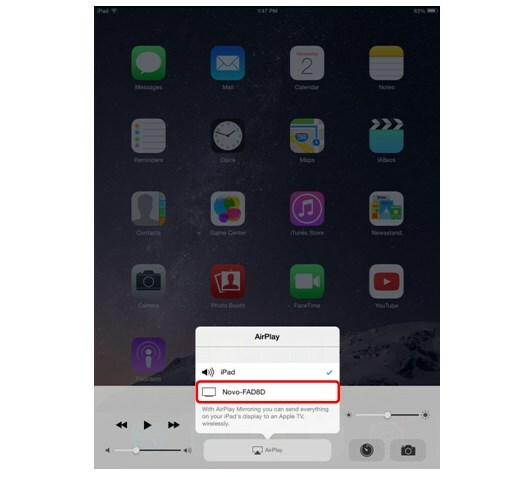 Switch on the mirroring option and you will see a popup windows for entering the AirPlay password. You can find the password from Novo device projection screen (illustrated below). After the correct password is entered, your iPad/iPhone whole screen will be mirrored to the projection screen. 6. Can I mirror my Android tablet/phone? Yes, you can mirror your Android tablet/phone to the projection screen via a Novo device provided that your tablet/phone supports Miracast-type screen mirroring. No app is required to use this function. 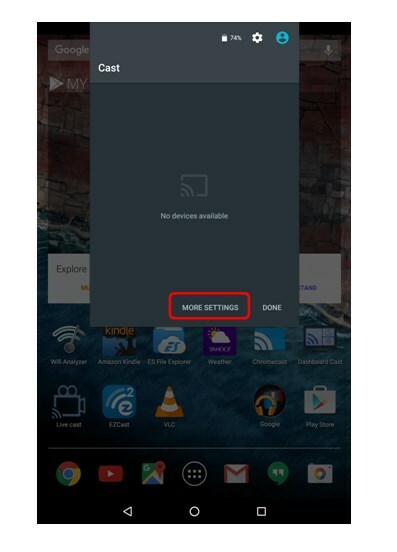 1.Connect your Android tablet or phone to the same network as your Novo device. 2. 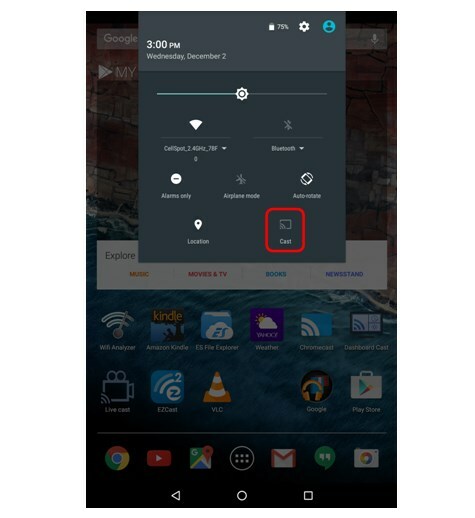 Swipe down from the top of the Android device to show the Control Center, and then tap Cast button. 3. You will see a connection history. If this is the first time you set up such a connection, this list is empty. Please tap MORE SETTINGS to continue. 4. After some scanning, you will see a list of available devices. Tap the one you desired to connect. In this case, Novo-C87F6 is the one. 5. Then your tablet/phone starts the connection process. 6. After a few seconds (up to a minute or two), if connection is successfully set up, it shows Connected. At this moment, your tablet/phone’s full screen should have been mirrored to the projection screen.